Oral history interview with Isadore (Isy) Walters. 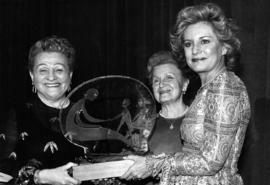 Photograph depicts two unidentified women and Barbara Walters who is receiving an award. 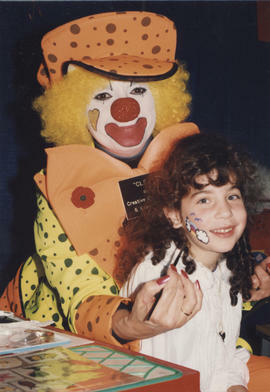 Photograph depicts Cleo the Clown painting Tara Adirim's face. Photograph depicts Mrs. Cohen flanked by two clowns. A group of children and other seniors is shown on the side.Written on the verso: "Page 4 - 2 cols. P. 19. Louis Brier Home. Mrs. Cohen. Nov 19 1971." Photograph depicts a group of entertainers in matching outfits, with the men standing behind and the women sitting in front with recorders and hand drums.Written on verso: "Jewish Community Centre. #5. Nov 24 1972. #1216-8. 37." Photograph depicts two clowns standing in front of signs. Photograph depicts a ventriloquist with a dummy performing before children in a dormitory-style room. Photograph depicts a clown painting a girl's face.Written on the verso: Dec. 27/90 p. 9 (right pic). 2 cols. Latkes. Chabad." Photograph depicts Annie Edel seated at a piano with Robert Edel standing to the right.